Dec. 13 will go down in history as the day Beyoncé cemented her Pop Queendom, managing to drop a surprise visual album on the humble masses. 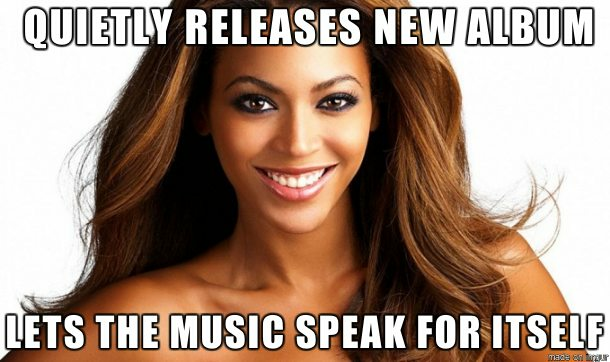 At nearly the stroke of midnight, Mrs. Carter snuck her fifth album onto iTunes. It features 14 new songs and 17 new videos. The shocking self-titled release jump-started a ripple of news that grew to a monsoon of Beyoncé mania as fans around the Internet quickly discovered the so-called Christmas miracle. It all began when the album slipped onto iTunes – with no fanfare or announcement. At least one user, VivaColdplay, happened to take notice, thus becoming the (probable) first person to react to Beyoncé’s big surprise. Holy cow is right! From there, Twitter claimed the initial social network “first responders,” with several superfans tweeting the news before Beyoncé even had a chance to announce it on the platform herself. Just after midnight, Beyoncé started her subtle promotional campaign, by posting to Facebook. Most Facebook followers didn’t even listen to the album before responding; they were too taken aback by their love for Queen Bey. Meanwhile, Instagrammers were almost #dying in reaction to the news. And Christmas came early for YouTube when previews of all 17 videos arrived, bringing joy and good tidings to all. More cheer came in the form of reaction videos and countless comments posted moments later. In sum, with this one startling album drop, Mrs. Carter melted the Internet. Now, much like the maybe-first reaction meme uploaded by Imgur user phy54, all we mere mortals can do is enjoy this magical, musical moment and reflect on the worldwide wonder that is Beyoncé.